Winding down the summer with another great week in 02139. 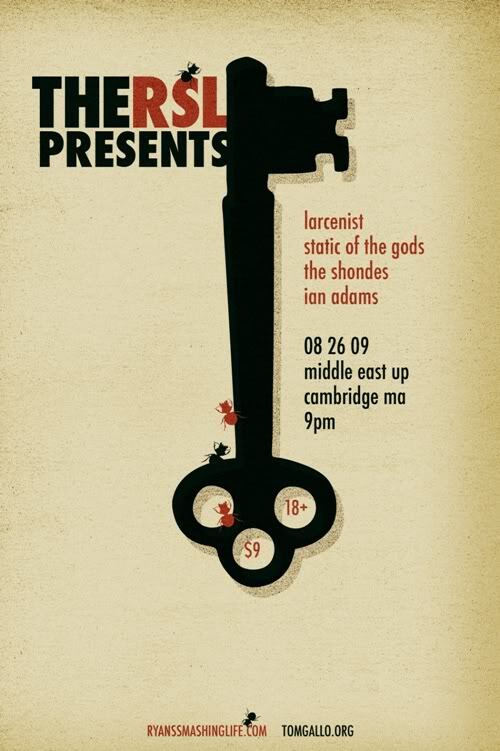 Tonight – Wednesday, August 26th – Ryan’s Smashing Life presents a great-looking lineup at the Middle East Upstairs, with Larcenist, Static of the Gods, The Shondes and Ian Adams. Full details at RSL, including lots of pictures and songs to download. Thinking of giving Plushgun‘s indie-electro a go on Friday night, not least because The Main Drag is one of the supporting acts. Finally, Saturday is the long-awaited One Night Band! We’ll have more on this later in the week, but you should go buy your tickets now. Yes, now.